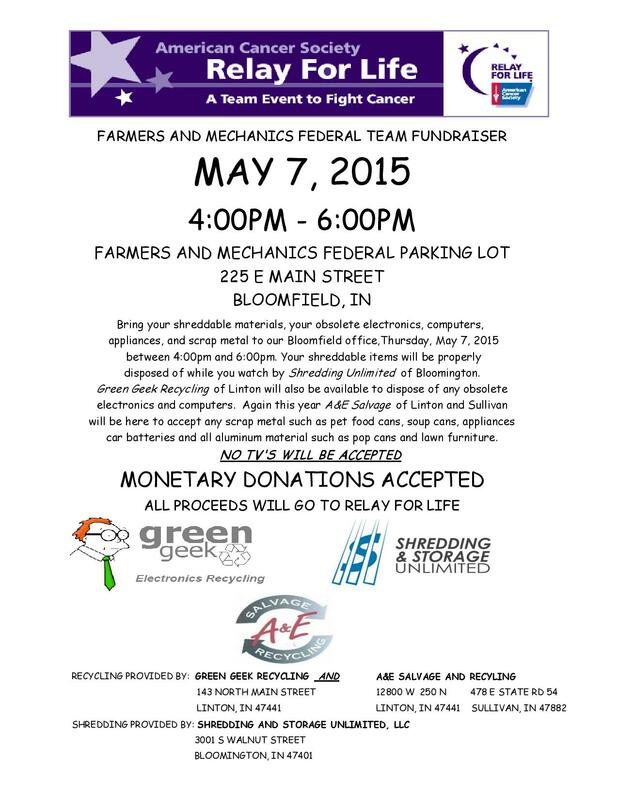 Shredding and Storage Unlimited is excited to be partnering with Farmer and Mechanics Federal for our first shred day of 2015 to support American Cancer Society Relay for Life. Bring your personal documents to 225 E Main Street, Bloomfield, Indiana on Thursday, May 7th between 4:00 – 6:00 PM and you can watch it be shredded for a small donation. Monetary donations will also be accepted and ALL proceeds will go to Relay for Life. 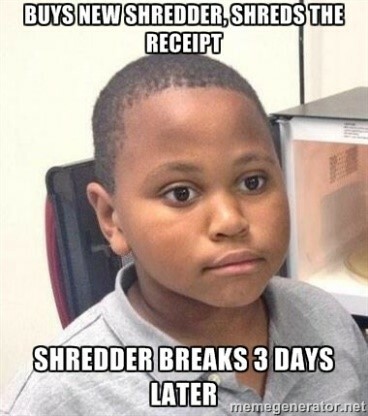 I saw the above meme online this weekend which inspired me to write some paper shredder reviews. I have spent several hours researching and googling the best paper shredders and I have included those reviews here. I don’t think there is any reason to test something that has already been tested to death. What I am going to bring to the table is a financial review that I cannot seem to find out there. I will also provide a comparison to using a professional service, which seems to also be completely lacking. I will do this in three parts starting with a low end, good value shredder that has great online reviews (4.3 out of 5 for over 1500 reviewers). Next I will review a more efficient and practical shredder that also has great reviews (4.1 out of 5 for almost 4000 reviewers). Finally I will review a commercial grade shredder from a company that claims to be more cost efficient than using a shredding service. I’m going to start with the shredder with the least upfront cost while still being fairly dependable based on reviews. Here is a graph of the breakeven point for the quantity of paper shredded when compared to Shredding and Storage Unlimited’s $5 per paper box standard fee. Now this only begins to tell the story. How about an estimate of 10 pages per day (about 30-40 seconds using this shredder based on reviews) for somebody who shreds very little. This is about as much as this shredder seems to be able to handle and is priced and advertised accordingly. That is 3,650 pages per year and would take a little less than 6 years and 10 months to reach the breakeven price point. I won’t factor in time spent since 30-40 seconds is a fairly marginal amount of time. From reading the over 1500 reviews on Walmart.com and the 10 reviews on amazon.com the longest time period somebody had owned the shredder was 4 years of uses every couple weeks, meaning that in the long run they probably would have saved $10-$15 over that period using a shredding company vs buying and using this paper shredder. This does not even include routine maintenance that must be performed to get the shredder to even last 4 years or that many reviewers claim that this shredder stops working within the first three months while most of the 5 star reviews are within the first 2 months. It is more economical to use a shredding service vs buying this shredder for people who do a light amount of shredding. When you want to do medium shredding (100-500 pieces per day) you may hit that breakeven point in 6 months (if your shredder does not break), but you are also spending 40 hours a year on just the time it takes to shred the paper. At this quantity Shredding and Storage Unlimited would come to you in our mobile shred truck one or two times per year and could do one year’s worth of shredding for $50 to $60. By saving $60 over the course of 40 hours of shredding you are valuing your time at less than $1.50 per hour. By valuing your time at a well below minimum wage $5 per hour, here is a graph of your hopefully indestructible shredder vs giving Shredding and Storage Unlimited a call based on a given amount of paper. *Does not include 30 minute shredder cool down time after 5 minutes of use or time spent on maintenance. This blog is being written to give you a peak behind the thick, secure, and highly reinforced curtain of confidential document shredding, document management, and recycling. I will be answering the questions that come up every day in the shredding industry, along with answering the questions most people do not know to ask. Now before you start believing everything I say (somebody working so closely with your personal information SHOULD have to earn your trust) I would like to introduce the company that I am a part of, Shredding and Storage Unlimited, LLC and myself. Shredding and Storage Unlimited, LLC is a company almost 30 years in the making. Storage Unlimited, LLC was started by my grandparents (Diane and Gary) with one of the first self-storage units in the state of Indiana. They dabbled in other things, such as digital storage and renting computer processing power about 20 years before everybody started Googling. To make a long story short, they came up with some good ideas along the way. One of those good ideas was confidential document storage (or they may have just had a thing for storage, see the trend) and Storage Unlimited Document Storage, LLC was started in 1997 by my parents, Dan and Chrisy. Storage Unlimited has gone through some changes in the last 17 years, box number 1 was shredded several years ago, more facilities opened, the main office is in a more accessible location, document shredding has become a more prominent service, and the company has gone through several name changes. Dan and Chrisy though are still at the helm treating every customer as if they are the very first, the climate controlled self-storage warehouses are still managed day in and day out by Diane, and prices on almost all of the products and services offered by Shredding and Storage Unlimited, LLC have remained the same (maybe that’s why we have haven’t found any outside stock holders, hmmm…). I’m Josh and you could call me one of the constant’s to Shredding and Storage Unlimited, LLC. I spent time in the office everyday as a 9 year old when the first document storage facility was being filled. I don’t remember that far back, but I probably helped shelve the first set of boxes that came in for storage and I know I helped with shredding when those boxes reached the end of their retention period several years later. To emphasize, all I remember is handling documents confidentially. You could also call me one of the changes to the company through the years. I left Bloomington, Indiana to get a business degree in operations and supply chain management, which was quickly followed by an MBA from University of Indianapolis. I went on to work for a couple small businesses, left those to climb the corporate ladder at a much larger business, and then I came back to Bloomington to become a part of what Shredding and Storage Unlimited, LLC had become. That is my intro to the Shredding and Storage Unlimited, LLC official blog. Find out how to reach us on our contact page. I would love it if you gave me a call with any questions about this blog or our services at (812)332-3299 or email me at josh@shreddingunlimited.com. Better yet, come visit us and you can pet “Fluffy the Shred Kitty” at our Bloomington Office or give me a call and we will happily come to you (but you won’t get to pet Fluffy).